West of Key West there is a very special place called the Marquesas. This atoll is group of protected islands and is where Jeffery Cardenas wrote his timeless classic, The Marquesas. Although now out of print, this book in my opinion is the best non-fiction book written on saltwater fly fishing. In the book, Cardenas, the former owner of The Saltwater Angler in Key West and Key West guide, takes a few fly rods, his skiff and a kayak, and lives aboard his rustic house boat, the Huck Finn. He parks the boat in the middle of the atoll and camps out for several week. Get a copy of this book and enjoy. For those of us who work a 9 to 5, or 9 to 6 or 9 to 9, this book is a great escape. Cardenas lives simply and intently. By the way, the Marquesas is a special place for me too. 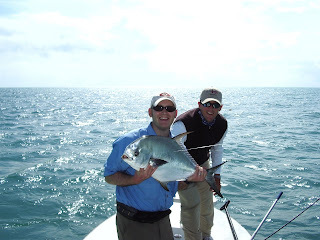 Here I caught my first permit. Here he is. NICE fish, bro. Permit are the pinacle... or however you spell that. Have to disagree about the book, though. Don't get me wrong, it's great, but The Longest Silence is certainly the top as far as non-fiction is concerned. I haven't made it all the way through your blog yet, so it may be that you mention this classic book elsewhere, but if by some miraculous chance you haven't read it, do youself a favor and grab a copy now.